This combo of images is so creative and fun! 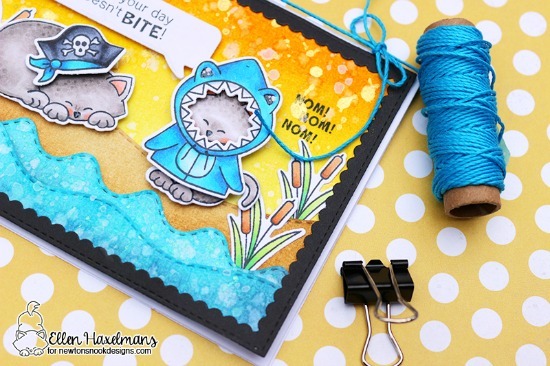 I love the idea of using the costumed kitties to create cards for occasions other than Halloween! OH MY GOSH!!! This is absolutely adorable!!! I LOVE it, what a creative, versatile idea <3 Plus Nom, Nom, Nom makes me giggle out loud!! What a most fabulous card!! Those kitties dressed up are just adorable and she created such a lovely scene to finish it off. Love that sentiment. It's fitting with the little shark kitty. That's a very creative card and Newton in this costume completely cracks me up !! !